Several years ago when I was in Korea, my sensei had a simple question on one of his promotion examinations. That question was, "What do you think about judo?" I dashed off some platitudes about maximum efficiency, improving the character and so forth. Good enough to pass. Lately, that question has come to haunt me more and more. There are some who say Judo is a way of life, others talk about sport, and still others argue about martial arts. "Judo is the way to the most effective use of both physical and spiritual strength. By training you in attacks and defenses it refines your body and your soul and helps you make the spiritual essence of judo a part of your very being. In this way you are able to perfect yourself and contribute something of value to the world. This is final goal of judo discipline." No words about sport here. In the second edition of the Kodokan Judo, Dr. Kano devotes a brief chapter to the philosophy of Judo. Here, Dr. Kano does talk about sport and its role in character development. He also talks about the use of physical education in training the body and the mind. Dr. Kano speaks of the use of kata as a training tool. The two great ideas of Kodokan Judo are maximum efficiency and mutual welfare and respect. If one studies the main source book of Judo, Kodokan Judo, one comes to realize that this is an art that involves physical education, sport, and unarmed combat (self defense). 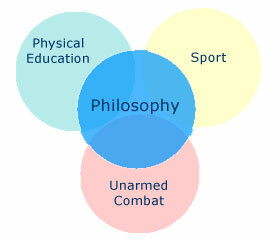 I believe that the Judo fields of study are best shown by the following diagram. All of the areas of study overlap. Physical education, that is the training of the mind and body, will have a bearing on both sport and combative studies. The human body moves because of muscular action which is the result of mental effort. You think about walking across the room and then walk across the room. The mind leads, the body follows, and all of the wonderful mechanics of walking occur. Without training in the skills needed, the body and mind cannot perform the necessary tactical and strategic movements needed for both sport and unarmed combat. The relationship between sport and unarmed combat is not easily seen at first. Combat sports evolved out of the need for warriors to train in a competitive manner. One could simply engage in full fledged fights. The problem of course is the attendant injury rate and loss of life. So, drills and games were invented to provide a way for warriors to practice needed skills with reasonable safety. What defines reasonable safety varies with cultures and historical periods. A good example of a combat sport is the joust. The joust was invented by European knights as a game to train in the use of lance. The game evolved to the point to where special armor, saddles, lances, and of course complex rules came into existence. However, many of the core values of using a lance on horseback in combat are trained by the joust. Combat sports all train certain core values that are important to the type of combat from which the sport evolved. Target shooting with a pistol from a fixed stance is often seen as very distant from the use of a pistol in combat. However, the ability to hit the target is an important core value for combat shooting. In sport judo the techniques are confined to throwing (nage waza), locking the elbow joint (kansetsu waza), chokes (shime waza), and hold downs (osaekomi waza). Contest techniques are further restricted to those that will not result in severe injury, provided the competitor is trained in falling techniques (ukemi). 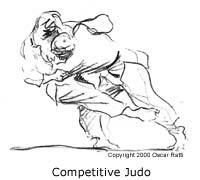 What then is the relationship of sport judo to judo as unarmed combat? In my opinion, the most important relationship is that judo matches are conflicts between two human beings. You must attempt to use your techniques against an adversary. In judo tournament, techniques are judged on effectiveness. To win by throwing, you must actually throw. It is extremely easy to throw a willing subject. It is an entirely different thing when the opponent is fighting back. Another issue is the simple fact that judo as a sport is rough. It is a full contact sport. You will be bruised, have your joints twisted, endure minor sprains, heat, exhaustion, and just general discomfort. In the small, tight world of the judo competitor your opponent is very close, at arms length or less. In this tiny universe you must learn to deal with fear, failure, pain, hardship and the joy of success. This type of training prepares you for what the U.S. military calls the "shock of combat." In other words what happens when someone hits you on your nose and the pain and bleeding start. Next, the ability to fall well is extremely valuable. In any fight one is subject to falls due to any number circumstances. For example, your opponent may throw or knock you down, or you may slip and fall due to conditions such as mud or ice. Being able to maintain your mental equilibrium even while falling and after is important. So sport judo provides some very core values in addition to building skill in grappling techniques. Unarmed combat (what many label as self defense) is different from sport. In a sense this is the actual battlefield application of techniques. It is important to remember that unarmed combat has a wide range of applications. The goals and needs of the civilian are different from the policeman which are in turn different from the soldier. Unarmed combat techniques within Kodokan Judo are found in the various kata. The kime no kata and Goshin jitsu kata are the two main examples. Training for self defense, police work, or any other application of unarmed combat is generally done in the form of katas. Katas are of two types. Generally when kata is spoken about, the reference is to formal exercises that are prescribed by those in authority. In the case of Judo, this is generally considered to be the Kodokan. One may also have informal drills which are used to train specific skills. Because the techniques used in unarmed combat may result in serve injury, kata is used as the training vehicle. What is interesting about judo kata, is that they are intended to teach principles as opposed to just technique. These principles are often applicable to sport as well as unarmed combat. The student of judo who desires to know more about unarmed combat needs to study the kata. The student also needs to realize that ideas and techniques are useful in both areas. An important difference is to recognize that sport judo rules have a rationale. First, the rules exist to provide a relatively safe means of competition. Second, the rules provide a means of defining the winner of the contest. Finally, the rules describe boundary conditions such as the contest area, and actions that are or are not allowed. The customs surrounding judo contests are designed to make it clear that it is sporting event and not a common street fight. For self defense, the judoka (judo student) should train to use all of the techniques available which includes atemi waza (striking the weak points of body). If all judo did was to train in the three areas above, it would not be much different from many other schools of martial art. What defines judo and makes it different is its philosophical base. First and foremost judo is an educational system. It is my opinion that Dr. Kano invented the belt ranking system ( kyu - dan ranks) as a means of grading judoka in terms of judo education. Like grade levels in college or other schools, this gave students a set of goals to strive for. It also provided a means of gauging progress. Judo is about the perfection of character. This is a process. The two great ideas of judo are maximum efficiency, and mutual welfare and respect. The first speaks to the concept of utilizing the body and mind in the most efficient manner. Within judo culture, the idea of ju is assumed to be the underpinning of maximum efficiency. But what is "ju?" It is a hard word to pin down. It has been interpreted as meaning gentleness and also flexible or pliable. I believe the idea is much more than a single word. The concept has to do with being able to blend with your opponent's force, take control of it, and then use that force to achieve your goal. The classic example is using the opponent's push and turning into a throw in the direction of the push. The other part of maximum efficiency is the idea of the correct use of strength. I like to tell beginning students that judo is not about strength, it is about the correct use of strength. Inherent in this is the concept of concentration of force against a weak point. Tilt someone's head back until he is off balance to the rear. Now push sharply down and slightly behind the person's feet. If done correctly, he will fall to the ground. The concept of mutual welfare and respect turns judo from a mere sport or even combat school into something quite different. It begins with the concept of reigi or courtesy and bowing. The bow (rei) in judo has many functions. First and foremost is the idea of mutual respect. By bowing the student says to the teacher, "I respect you and will follow your instructions to the best of my ability." The teacher's bow means that the teacher respects the student and will teach to the best of teacher's ability. Between students, the bow signifies mutual respect and a desire to train each other. In judo tournaments today one still sees and hears judoka giving each other help. Many times I have seen the winner of a contest go to his opponent after the match and congratulate him or her on a well fought contest, and then offer some advice on how to improve. Within the school students strive and work together to improve. This idea of progressing as a group is important in judo. Judoka are taught that if one student improves, then all improve. So just what is judo? Judo can be practiced with an emphasis on any one of the three physical areas: sport, physical education, and unarmed combat. While the judoka may choose one area in preference to the others, he or she should learn about all three. The philosophy of judo and in particular the goal of self perfection makes judo the unique art that it is. Without these ideals, judo is at best an interesting sport and possibly a means of unarmed combat. I think of judo as a martial art. Because of the philosophical ideals judo is something more. Viewing judo as an educational system founded on the ideas of self perfection, maximum efficiency, mutual welfare and benefit changes it. What we have is a martial philosophy or way of life (do). It is marital because the base techniques have to do with fighting. The major training method ("the giving and receiving of attacks") is martial in nature. It is on the anvil of rondori (free exercise), shiai (contests), kata (forms), and the general training that the judoka forges his or her character. These are martial exercises and result in a "warrior" point of view. The philosophy (do) takes the martial values and focuses them so that as Dr. Kano said, "In this way you are able to perfect yourself and contribute something of value to the world. This is final goal of judo discipline." Victor Anderson is a martial arts researcher who has praticed judo since 1960. He has studied in California, Korea, Texas, Panama, Virginia and is currently a third degree black belt and member of the Sacramento Judo Club. He is a nationally rated judo referee and coach and as competitor has placed 2nd and 3rd in USJI Masters National Tournaments. His study of judo is to approach it as a martial art, that can be practiced as a sport. 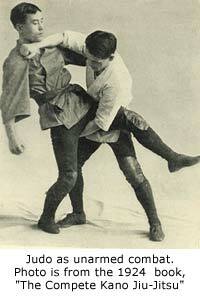 He also studies striking of vital areas (atemi waza) as part of judo self-defense. Other arts he has studied include Hopkido (shodan), aikido, shudokan karate, boxing, wrestling, tai chi chaun and pa kua chaun.